Inconvenient Truths are things that require attention and acknowledgment even though they may be difficult to do or accept. What Inconvenient Truths can you identify as potential sticking points for your organization? Diagnosing deep organizational needs before diving into real people transformation. Overcoming a fragile economy and increasing competition to drive sustainable growth is both the CEO’s key challenge and responsibility. Learn about shifting Organizational Mindsets for Growth and Adaptive Change. “Dr. Richards nails the Corporate Conundrum, a tangible path to innovation through transformational leadership”. 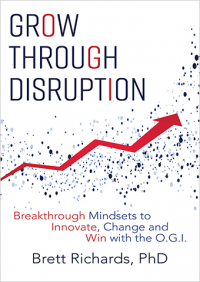 “Grow Through Disruption is an important read for any executive who wants to shift their organization’s mindset to drive growth, innovation and positive transformation”. How can companies become better at Innovation? Companies need to gain a competitive edge. Think your company is ready for growth, but you're not sure how? You may be missing the key metrics that can tell you why and inform your decisions on how to move forward. In today’s fast-paced, knowledge-based economy, leaders don’t have time to waste grappling with fuzzy data. 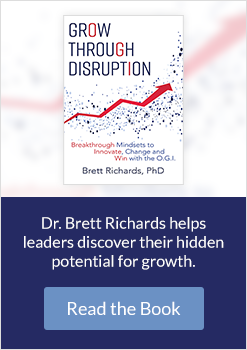 That's why Dr. Brett Richards, founder of Connective Intelligence Inc., developed the Organizational Growth Indicator™.